“This is such a massive problem with rooming houses that I don’t think it’s enough for one person to handle it.” Laura Philip hit the proverbial nail on the head when she made this statement to the reporter for The Sou’Wester (see article below). Since focusing on the illegal rooming house issue when I was elected in fall 2014, I’ve worked to peel back layer upon layer of involvement by many stakeholders in order to understand the crux of the issue: long-term residents, student recruitment agencies, by-law enforcement complexities, real estate revenue properties, Canada Revenue Agency, insurance and mortgage companies, fire inspectors …..and the list goes on! These and many other organizations and individuals all have some kind of stake in the extremely profitable, but illegal rooming house issue which is prolific in neighbourhoods around the University of Manitoba. Many dedicated residents, City staff, summer interns, myself and Bev Sawchuk (Operations Manager for our Ward) are all working on this complex issue. And we have more work to do! Laura Philip is indeed correct, and I am very thankful area residents and so many others are now involved in this issue. With the invaluable support of Summer Intern, Hailey Hooke, and Bev Sawchuk, I’ve compiled a Councillor’s Report to the Community which will be released at the end of August on my website. The Sou’Wester has done an excellent job of highlighting challenges, and the reality is we have over 150 ‘suspected’ rooming houses in our database. BUT over the past three years, we’ve facilitated many, many positive changes: increased education, more teeth in by-laws, hiring of more enforcement staff, development of relationships with many stakeholders, and more. 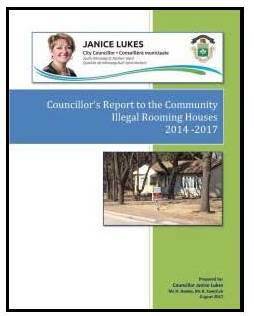 The forthcoming Councillor’s Report to the Community will highlight the past three years of work on illegal rooming houses, and present an overview of what is being planned for the future. Please watch this website for details! NOTE: If you have concerns about a potential illegal rooming house, please take action and report it. See details on my website: Properly Reporting By-Law Infractions. My thanks to The Sou’Wester for reporting on this important issue. Stepping around puddles and striding through the rain on one of the most notorious streets for rooming houses in Fort Richmond, Janice Lukes can spot the tells of a rental property from down the block. “That house is shady,” Lukes, the city councillor for South Winnipeg – St. Norbert, said, approaching a 1,000-square-foot home recently listed with five bedrooms for sale on Grierson Avenue. PHOTO BY DANIELLE DA SILVA: Unkept lawns are one of the biggest complaints homeowners have of rooming houses in their neighbourhoods. Often properties do not have someone designated to care for the lawns, and landlords are either absentee or located overseas. A quick peek in the front living room window of the supposedly single-family home confirmed her suspicions about the property. The space had been converted into a bedroom, complete with a number on the door and a key hanging in the doorknob. Across the hall, black and gold stickers marked the doors of rooms No. 2 and 3. It’s one of about 15 illegal rooming houses identified by Lukes [NOTE: 15 houses on Grierson Avenue – comment by Janice Lukes], and a team creating an inventory of suspected properties on that street alone. Since late 2014, Lukes has been spearheading a campaign with local homeowners to crack down on the illegal rental properties and get landlords into compliance with neighbourhood livability bylaws and fire safety regulations. Over time, homeowners have seen their neighbour’s front yards be taken over by long grass and weeds, carports filled with trash, and backyards converted to six-car parking pads as houses in the area have been purchased and converted into dorm-style residences by absentee or overseas landlords. Incidents of basement fires in the illegal rental properties have also put tenant safety front and centre. Through a community-wide education campaign, targeting homeowners, tenants, and landlords on livability standards and how to report bylaw infractions in the quiet suburb, Lukes said there has been some relief for residents. Bylaw enforcement officers are in the community — with two new fire inspectors and one bylaw inspector recently hired to try to stay on top of the complaints coming in from residents — but still progress has been painstakingly slow. “In the beginning it was excruciatingly frustrating when I didn’t understand the enforcement process,” Lukes said. “It’s a very sensitive issue, it’s housing, it’s hard to prove, and it’s complex. However, for Laura and William Philip, who’ve lived in their Thatcher Avenue home for over 50 years, the action on rooming houses in the community may be too little, too late. “There’s no problem with the students — it’s the owners we have problems with,” added William. The two said reporting the issues they see on their block to the City isn’t having a great enough effect. In some cases, problems with excessive garbage or unkept yards are cleared within a day or two of reporting, but reoccurs within weeks. Based on what they’ve seen in the neighbourhood, the retirees contend there aren’t enough resources to make a dent in the issue and feel they’ve exhausted their options as well. “This is such a massive problem with rooming houses that I don’t think it’s enough for one person to handle it,” Laura said. According to data provided by the City of Winnipeg, in 2015 bylaw enforcement officers issued 74 compliance orders for properties with long grass or excessive vegetation, 28 for litter and garbage, and 35 under general neighbourhood liveability. In 2016, numbers increased a slight bit, with 79 orders issued for non-compliance on vegetation, 43 for garbage and 30 under general neighbourhood livability. Compliance orders were primarily issued for tall grass, weeds, garbage and basement bedroom window size. Calvin Patrick, a Fort Richmond resident of about 20 years, said his frustration lies with the perceived lack of will by officials to enforce bylaws meant to keep the community in order. He estimates the number of complaints coming into the City outweigh the number of compliance orders going out. Conditions in the neighbourhood have been steadily deteriorating. Patrick lamented, and feels as though he is being pushed out of his home. Patrick said enforcement is too slow when complaints are raised through 311 and issues remain unresolved. “If there was enforcement and they took a firm stance on what was going on then somebody would put a strong enough lean into whatever is going on and it would mean something,” he said. According to Jacquie Field, president of the Fort Richmond University Heights Neighbourhood Association, data on the number complaints the City receives from people in the neighbourhood and the subsequent follow-up isn’t easily accessible. “The City doesn’t haven’t a way to be able to provide you with information on whether what you’re doing is succeeding,” Field said. “All of the education that’s gone on in the community and perhaps the media coverage too has, I think, made a difference, but we don’t know that because we don’t have data,” she added. “We do see an improvement in the property, and we do see the bylaw officers coming a little more frequently — I mean there aren’t many bylaw officers in this town and these are small problems for them. The neighbourhood association recently struck a subcommittee on data collection in concert with Lukes’ office to get a more complete picture of the results of reporting and enforcement levels. Lukes said a new data reporting procedure will result in more accountability when it comes to enforcing bylaws in the neighbourhood, including the recently revised parking bylaw and fire prevention bylaw. Beginning in January, Lukes said she will be getting regular quarterly reports from the public service that show how many requests were made for inspections, how many homes were inspected and how many were shut down. The reports will also summarize how many infractions were noted and how long it takes to remedy. Another tool being considered to address rooming houses is a licensing mechanism and the rezoning of parts of the neighbourhood to accommodate housing options other than single family. Lukes has asked the public service to study how other university towns licence rooming houses and student accommodations and report back in October. An information session on potential property rezonings is also scheduled for the fall, Lukes said. 1. Unruly grass — Most of the compliance orders issued in Fort Richmond under the Neighbourhood Livability Bylaw had to do with vegetation, weeds and tall grass. 2. Excessive vehicles — Some properties being used as rooming houses have had the backyards paved over to allow for multiple cars to park off the back lane. 3. Garbage on the property — Residents have complained that garbage is an ongoing issue with rooming houses in the neighbourhood and often garbage carts are left in the streets for days after they’ve been emptied. Between 2015 and 2016, 71 compliance orders were issued related to garbage and litter. 4. Questionable rental advertisements — Landlords have become more discrete in listing rooms for rent by advertising a whole home as being available but insisting individual tenants sign under one lease. 5. Construction on the property — Since awareness has been growing about illegal rooming houses, landlords have been installing egress windows and making renovations to their properties to come into compliance with fire regulations. However it’s suspected that some jobs in the neighbourhood have been completed without the proper permits. 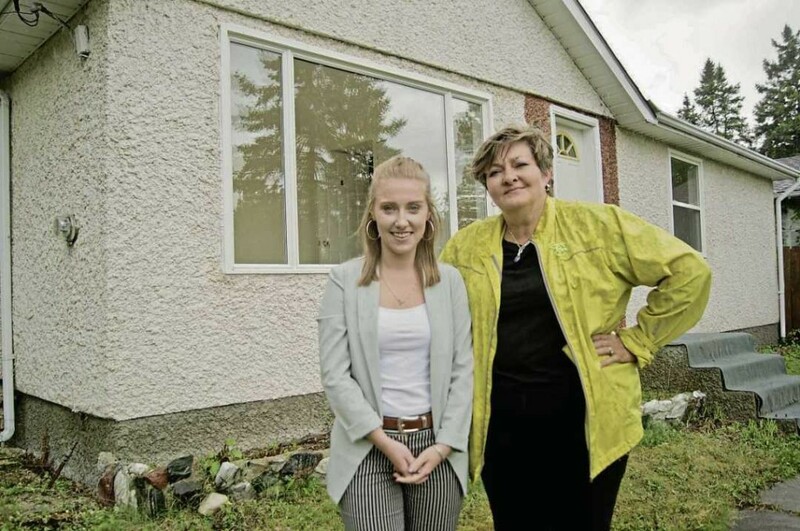 COVER PHOTO BY DANIELLE DA SILVA: South Winnipeg-St. Norbert city councillor Janice Lukes (right) poses with summer intern Hailey Hooke outside of a suspected rooming house on Grierson Avenue in Fort Richmond. The two are working on creating an inventory of illegal rooming houses in the neighbourhood and are compiling data to help curb the conversion of single family homes to rental revenue properties.